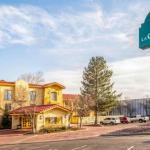 Our guests love the location as well as comfortable rooms at the La Quinta Inn Colorado Springs. Set against a background of the eastern slope of the Rocky Mountains the hotel gives you easy access to the region's most famous sights. The three-story hotel identifiable by its barrel-tile roof has a warm welcoming feel. The 105 rooms have up-to-date touches like free Wi-Fi so you can stay online for as long as you like. Surrounded by tall trees the outdoor pool is a great place to relax after hiking or biking through the nearby national parks. The free breakfast buffet served in a cozy breakfast area off the lobby will help get you going in the morning. If you're traveling with the family dog La Quinta Inn Colorado Springs is one of the most pet-friendly hotels in the area. You won't even be charged extra for the privilege. Off the major highway of I-25 La Quinta Inn is on the way to most of the area's natural wonders. Garden of the Gods one of the biggest draws is six miles southwest. It's on the way to Pike's Peak reachable by car or cog railroad. Ute Valley Park is three miles northwest and Pulpit Rock Park is three miles northeast. Colorado Springs Airport the city's main gateway is 16 miles southeast.